Each situation you are preparing for the McKinsey PEI needs to be well structured. It is not only about telling an example – you also need to get the main topics across in a short period of time, which is roughly 10-12 minutes out of the total interview time which is allocated to the PEI. Therefore your Personal Experience Interview example needs to be structured in a way so that you do not spend too much time explaining the basic situation (which is talking about the “problem”, “anticipated consequence”, “role” and “end-result”, according to the PARADE framework explained below), but having enough time to focus on those parts of your example with which you can really convince your interviewer. Namely those parts of the example which show your mental thought process and the resulting behavior (mostly the “action” and “decision-making rationale”, according to the PARADE framework). The STAR framework is a very general framework, oftenly used in interview situations also outside of McKinsey and consulting firms. It is definitely helpful to communicate any experience of your past in a structured way. Situation: The situation describes the general situation in which you faced a challenging experience. This could be from your current work, recent internship, extra-curricular activity or even from a private setting. This will give your McKinsey interviewer an overview of the context, which is needed for any behavioural interview (as opposed to a situational interview, in which you are asked to talk about a hypothetical situation). Task: The task is your responsibility/job in that situation, or the result which you want to achieve. The specific task will of course depend on the respective PEI dimension (Leadership, Personal Impact or Entrepreneurial Drive). Action: The action describes how exactly you fulfilled the task and overcame the involved challenges. The focus is clearly on your individual action, and not on what the team was achieving together. Since McKinsey will hire only you and not the whole team, your interviewer won’t be interested in any other actions than yours. Result: The result descrives the final outcome by your actions. Usually it will just be a short wrap-up of your example, without too much importance since it’s mainly about your actions anyway. Sometimes your interviewer will even finish your Personal Experience Interview before having you describing the result. Basically the PARADE framework is quite similar to the STAR framework, just modified and enhanced with those aspects which are truly relevant for the McKinsey PEI. Therefore I recommend rather using the more tailored PARADE framework instead of the more general STAR framework. At the same time I don’t see a need to re-invent the wheel by coming up with one more additional structure as the PARADE framework already fits very well. So let‘s have an overview as well as a closer look at the PARADE framework. Problem: This part contains the basic outline of your situation, ensuring that the interviewer gains enough information about the situation so that he can evaluate your behavior and contribution to it (which is to follow mainly in the action and decision-making rationale part). The key challenge lies mostly in making this problem statement as short as possible and as long as necessary at the same time, to make sure the interviewer has a good understanding of it. Anticipated consequence: The anticipated consequence shows your personal impact on a situation (your “real-life” impact) by depicting what would have happened in case that you were not part of this situation or did not act in an appropriate way. In other words, this is to show the gap between the real end result and the otherwise anticipated consequence. Obviously, the greater the gap between those two, the bigger your impact and thus the more powerful your example will be. Role: To get a good grasp on what your contribution actually was in the specific situation, your interviewer needs to clearly understand your role in this situation. Therefore you should primarily talk about your specific role in the situation (using „I“), and not about what you achieved together with your team (and therefore not using „we“). Action: Here you need to describe in great detail what exactly you did in this situation. Again, the focus is specifically on you, and not on your team. As this will be the basis for the interview part which matters most (which will be the next part, namely the decision-making rationale), your action needs to be closely interlinked with what you will tell the interviewer about your rationale. Expressed with some slight exaggeration we could even say that for each and every action step you take, there should be a clear decision-making rationale attached to it. Decision-making rationale: This is the part in which the interviewer will take the most interest in, and will most likely be the part on which you will spend the most time on during your PEI in conjunction with the respective action. End-result: The end-result if often just a 30 seconds wrap-up of your whole example, to give the interviewer the big picture at the end again. Even though your actions and decision-making rationale are by far more important than the actual end-result, of course the more impressive it will be, the more it will stick in the interviewer’s mind (all other factors being equal) when making the final decision which candidates he will pass on to the next interview round. 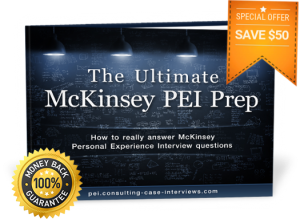 You can find much more information about how to structure your examples and where to go deep to highlight the relevant skills for McKinsey in The Ultimate McKinsey PEI Prep eBook! Previous Previous post: Considering the three McKinsey PEI dimensions Leadership, Personal Impact and Entrepreneurial Drive – is it a good idea to include aspects from other dimensions in your PEI example? Next Next post: Can I use the same PEI example in different McKinsey Personal Experience Interviews?